One Meridian Plaza was a 38-story high-rise office building in Philadelphia, Pennsylvania, United States. The 492 feet (150 m) tower was designed by Vincent Kling & Associates and completed in 1972. 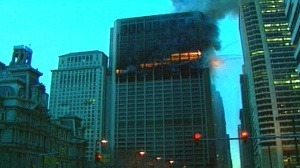 The building was demolished in 1999 as a result of damage of a fire that began on February 23, 1991. The fire began on the 22nd floor after linseed oil soaked rags ignited a blaze that raged out of control for hours. Philadelphia firefighters fought the blaze, but struggled due to a lack of power in the skyscraper and insufficient water pressure from the building’s standpipes. Three firefighters died in the twelve alarm fire after becoming disoriented by heavy smoke.Firefighting efforts inside One Meridian Plaza eventually were abandoned due to fears the structure would collapse. The fire was only brought under control once it reached the 30th floor which was one of the few floors that had automatic sprinklers installed. Ten sprinklers held back the fire until it started burning itself out and was finally brought under control almost a full day after it started. The blaze seriously damaged the building destroying eight floors and damaged neighboring buildings.